It is looking like spring at Alby Crafts & Gardens, with carpets of hellebores, daffodils and chinoxia. The ponds are lively with little frogs peeping up out of the water and the ditches are bright with of mounds of primroses. 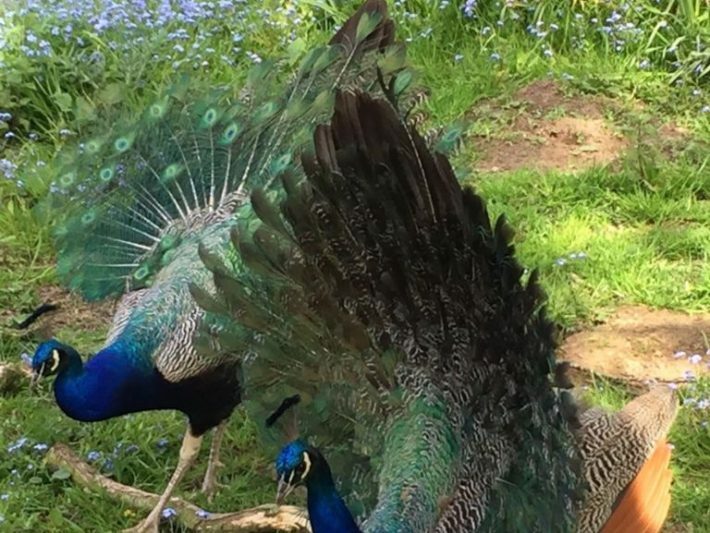 The male peacocks have been sizing each other up, putting on fabulous displays with their massive tails while the females keep an eye on proceedings. What better place to visit when the sun in shining and you have a little time off over Easter? After a stroll around the garden and galleries, treat your family to one of Glen’s popular dishes in our quirky café. He serves delicious lunches freshly cooked from locally sourced produce, and has a magnificent selection of gluten free cakes. Or bring the younger members of your family along to the Easter Egg hunt on Saturday 15 April, from 10am to 2pm. The resident designer-makers at Alby are always pleased to welcome you into their galleries and to show you their products. From dressmaking and upholstery to calming flower essences, and from ceramics and furniture to fine art prints and sculpture – all are created on site. There is nowhere else quite like Alby Crafts & Gardens. For more details about our resident designer-makers and special events go to www.albycrafts.co.uk.